“A PICTURE paints a thousand words… and this is the scene in Harrow Road where two offices that once provided invaluable advice to those in need have been forced to close. 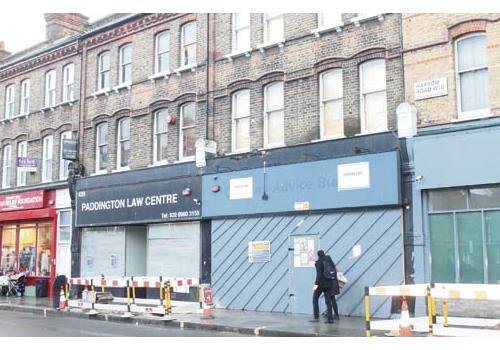 The headquarters of Paddington Law Centre, which is the second oldest organisation of its kind in Britain, will be boarded up on Wednesday after more than 40 years of helping Westminster residents with legal matters ranging from an unfair dismissal at work to an unjust eviction at home. Meanwhile the neighbouring Citizens Advice Bureau has closed and moved to Conduit Place in Paddington. Westminster North MP Karen Buck sees this as characteristic of a worrying trend, which she described as a “massive withdrawal of services”. It follows the loss of Westminster Council’s OneStop advice centre and the police station, both in Harrow Road, and imminent closure of the Jubilee Sports Centre in nearby Caird Street. Cuts to civil legal aid and a squeeze on funding from other sources has forced the collective of solicitors to close their offices. They have entered a partnership with the Central London Law Firm and will be based in Soho, while continuing to provide legal advice in the north of borough. Leroy Pitter, a solicitor at Paddington Law Centre, said: “We are going to continue to have a presence in W9 and will continue to provide the same level of service. The charity store next door, the Human Relief Foundation, said they have been inundated with concerned residents dropping in to ask what was happening with the law centre. Nicole Smith, of Elgin Avenue, said: “The people who worked there had helped me and most of my friends who live around here. This entry was posted in Harrow Road, Karen Buck MP, Labour Councillors, North Paddington, Paddington Law Centre, Westminster North and tagged labour councillors, Paddington. Bookmark the permalink.